It was the best faux-pizza I’ve ever made, actually. Hands down. 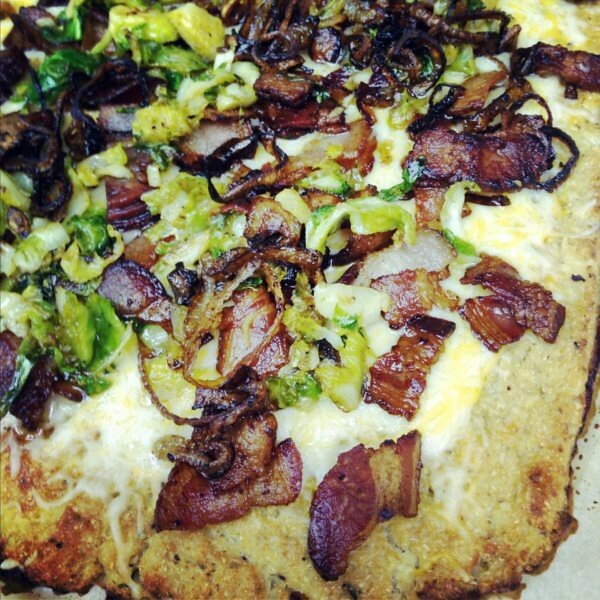 It was a cauliflower crust topped with bacon bits, sauteed sliced brussels sprouts and a sprinkle of crispy shallots. When I took the first bite, I realized that this was one of those recipes that needed to IMMEDIATELY make it’s way to the blog. But I feel the need to make a slight disclaimer: my love for Paleo aside, I am firmly in the camp that pizza has no substitute. Pizza is doughy and bready and indulgent — well, at least the good kind is — and when I hear about things like Cauliflower Pizza Crust — I don’t care how good it is NOT REAL PIZZA CRUST. You will not sell me on the fact that this is as good a Real Pizza. So I am not making that claim. I will not try to foolishly dissuade you from loving Real Pizza. There is no substitute. But the thing is, we all need to eat our vegetables, and cauliflower *IS* a pretty yummy and versatile. So when you make that vegetable into something crusty and add some delicious toppings, it actually turns into a pretty amazing (guilt free!) dinner. And a pizza-like dinner, no less. So even though I do not claim this is will all of a sudden replace your desire for deep dish, I will claim that this will be one of the best Friday night meals you’ve ever had when all you have in your fridge is a few vegetables and a couple slices of bacon. 1. 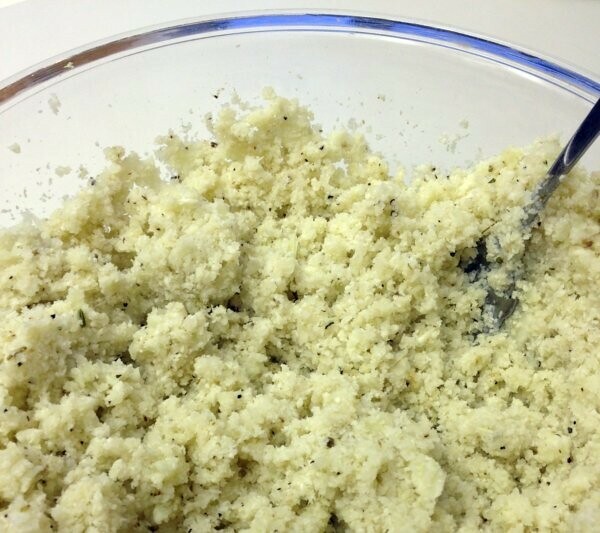 Chop your cauliflower in the food processor until it is finely minced. It sounds like a pain but trust me it will be worth it. When it’s shredded into a fine powder, pop it in the microwave in a bowl for 6 minutes. No need to add water or anything. Let it cool for about the same amount of time. 3. Spread on a cookie sheet covered in parchment paper (a must!) until it is fairly thin and looks like a big ol’ pizza crust. 5. While crust is baking, fry up some bacon bits in a pan. You know how to do this, it’s easy — I only had 5 slices of bacon and I was fine. But if I would have had more, I would have added more. More Bacon=Better. I think it’s science. Pull those puppies out and lay them on a paper towel somewhere. 6. 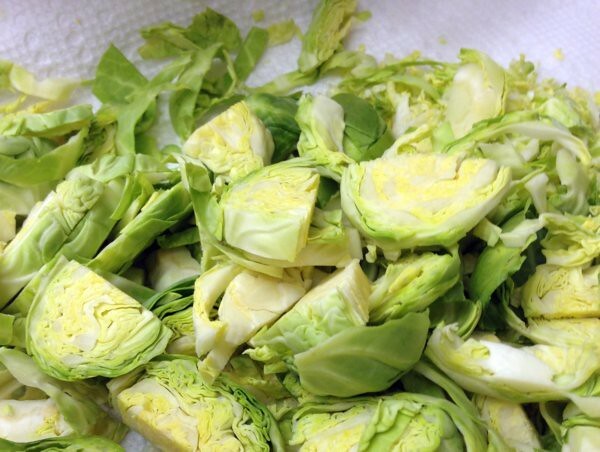 Then slice up about 8 clean brussels sprouts into ribbons and throw them into the hot bacon renderings. This is always delicious. 7. When they get nice and sauteed and have a little color on them, pull those out of the bacon renderings too. You can even throw them on your bacon bits sitting there. It’s ok to mix everything together — GET WILD. 8. Thinly slice a whole shallot and throw THAT into the bacon renderings. These renderings are really doing triple duty. Let them get so crispy they almost appear burned. 9. Pull out your crust when it’s browned, top with cheese (no sauce!) top with bacon, brussels and crispy shallots and then throw it into the oven for about 5 minutes just until everything is melty and delicious looking. 10. Let it cool about 5 minutes, slice, serve and enjoy. 11. Serve with a salad and then smugly realize you are eating A LOT of vegetables, even though it feels like you are having Pizza Night! Do you have any favorite variations on Cauliflower Pizza Crust?